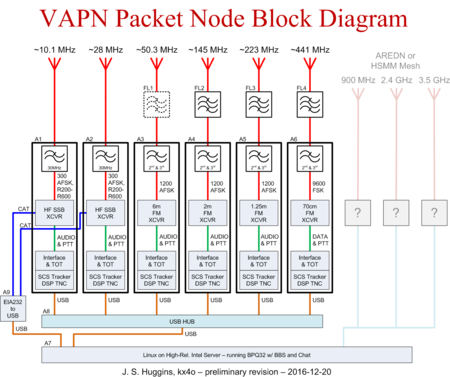 Planning a multiport packet system in old times required multi-port EIA232 devices to attach all the various TNCs. Move forward a couple decades and modern computers with serial ports are a rare find indeed. Modern TNC manufacturers know this and now design products like the SCS Tracker DSP TNC… our notional TNC for all our ports. Sometimes you just have to bury the past in the past and join the modern world as we have done for VAPN. USB = Universal Serial Bust? The Universal Serial Bus wasn’t really supposed to be a sturdy industrial interconnection scheme, but more to provide end users with a mostly compatible, dirt simple way to interconnect peripherals. The USB standard even regulates the insertion force of the USB connector to ensure physically challenged folks can benefit from the system. I think we can all agree, USB has indeed achieved that goal. However, creepy weird behavior does crop up now and again as it did for us detailed in our Plug and Pray article. Long story short, moving the two SCS Trackers on our prototype system to the same internal USB bus controller solved our problems. Thankfully two ports on that one bus in the system computer were available, but our plan is for many more Trackers. The time came to test an external USB hub with the system with its two Trackers. Knowing the SCS Trackers use older USB specifications, I stayed away from spiffy USB 3.0 capable products. I noticed some of these hubs seem to focus a lot on being able to charge multiple devices simultaneously. This feature is of no interest to us. Yeah those data rates are sure nice when using peripherals like the Trackers maxing out at 38,400 bps serial rate. Of course USB has tremendous overhead packets flying back and forth you never see so keep in mind that 38,400 is nowhere near the entire load on the USB link. The devices connected to the 13 Port hub must not exceed a combined current of 5 volt 2.5A. Each USB port on our 13 Port hub will only provide 5 volts 300 Milliamps. External hard-drives should be connected to an external power source. 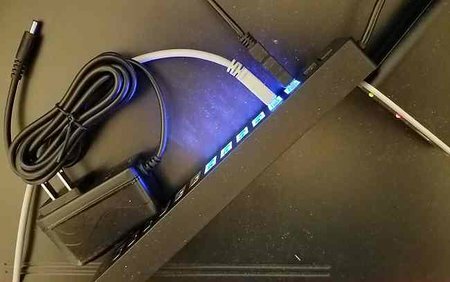 This hub functions as a USB hub only, to connect USB 2.0 and USB 1.0 devices to your computer, and is not a standalone device charger. This hub is not recommended for ASIC bitcoin miners. No bitcoin mining. Got it. Under $30 shipped! Buy a spare. Here is the Sabrent as installed in the current prototype system laying atop the Super Micro system controller server. Two SCS Trackers plugged into Sabrent Hub while 30m ports transmits a Robust Packet beacon. There were zero issues installing this thing. I simply plugged both SCS Trackers into the Hub and the Hub into one of the two ports vacated by the Trackers. One reboot and everything was recognized just fine by Linux. The automatic udev identification system worked perfectly and each Tracker was assigned properly to its BPQ32 port. Marvelous. The prototype system is working fine. The manufacture does not specifically mention Linux in its supported operating systems, but it works fine with Ubuntu. The blue backlight on the ports indicate which ports are activated. The hub includes two pushbutton switches, seen upper right, to activate the first and second groups of six. The unlucky thirteenth port is on the far end, lower left in the photo, opposite the potted cable end, upper right. Computer hardware evolves in strange ways, but I’m sure this feature is of great value to someone. For VAPN we have one bank active. The Tracker consumes 120 mA max on its DC import port, but that doesn’t apply here because the USB side is optically isolated from the modem circuits. I measure the Tracker’s USB power consumption at 10 mA, well less than the 300 mA per port max of the Sabrent Hub. If nothing else, the Tracker is thrifty on power. You’ll note we are not using the convenient external power supply option supplied with the Sabrent Hub. So far the USB power requirements for two Trackers fits well within the supply spec from the system controller. Indeed the Trackers consume very little current from the USB ports so powering them all in the final system without additional power is a possibility. Should we need more power, we will give the power adapter a try, but I’m betting this thing is a noisy switcher power supply not ideal for HF. 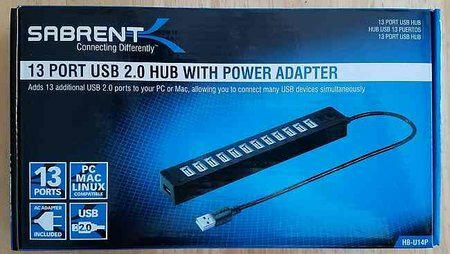 Some things in life just work out of the box and the Sabrent 13 port USB 2.0 hub appears to be one such thing. It is about as transparent as I can ask of an interconnection device. Time will tell if more Trackers throw this over some threshold, but so far so good. Yeah I would have preferred a USB Hub more appropriate for rack mounting, but sometimes you just have to innovate in different ways. Time will tell how we dress this hub in our final system configuration.